FOTORBIT is offering a very unique opportunity to photography enthusiastic people. We have designed a 2days intense workshop to redefine the most photo-worthy place in the world i.e Taj Mahal. The Taj Mahal is the most photographed place in the world. So it remains always a big challenge to shoot Taj in a different way…in a way that many people have not done yet. With that very challenge, FOTORBIT has curated this all new endeavour to celebrate a date with Taj, to romance and rediscover it with all its beauty and testimony of love. FOTORBIT is here to guide you through three different photo-shoot sessions with model, in three different locations, in traditional and western outfit in and around the Taj Mahal from some lesser known and difficultly approachable points to redefine the Taj as a unique symbol of love. 23rd Jan, 2019 (Wednesday) : Check – in to our pre-booked Hotel around 12 noon (standard hotel with clean room, western toilet and AC). Have your lunch and settle down. Afternoon we will have an introduction session followed by brief classroom session on outdoor portrait shoot. We will discuss on camera settings, light, position etc. During sunset we will conduct our 1st shooting session. Overnight stay at Agra. 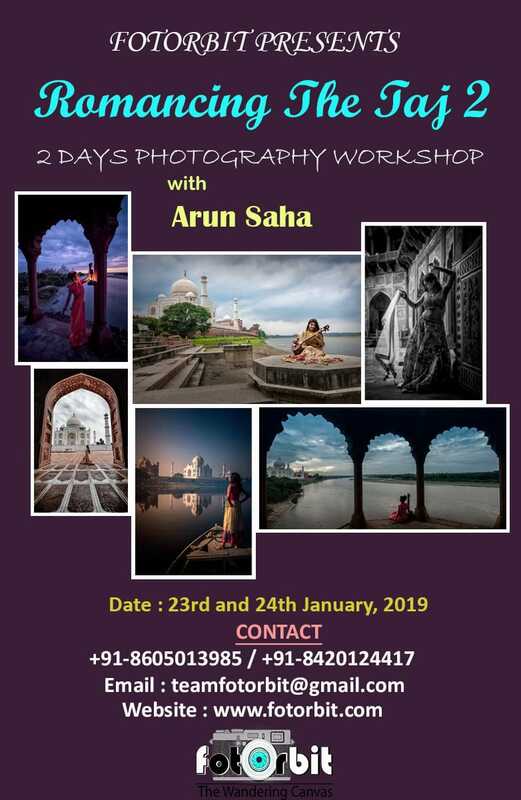 24th Jan, 2019 ( Thursday) : Our 2nd session of photo shoot will start at early morning inside the Taj Mahal. 3rd and last session of model shoot will be done outside the Taj Mahal, on a boat over the river Yamuna with the Taj at the backdrop. After lunch, we will have a classroom session to review all the images made by our participants and post-processing guidance. Overnight stay at Agra. 25th Jan, 2019 ( Friday ) : After breakfast, we will pack-up and end of our workshop. Shared double bed room (same gender participants) in a standard clean hotel at Agra, with western toilet and AC. For separate room extra charge is applicable. It will cover your main meals (breakfast, lunch and dinner), starting from 23rd Jan, 2019 lunch to 25th Jan, 2019 breakfast. Train/flight tickets to and from Agra. Any extra mineral water bottle / beverage will be your personal expense.